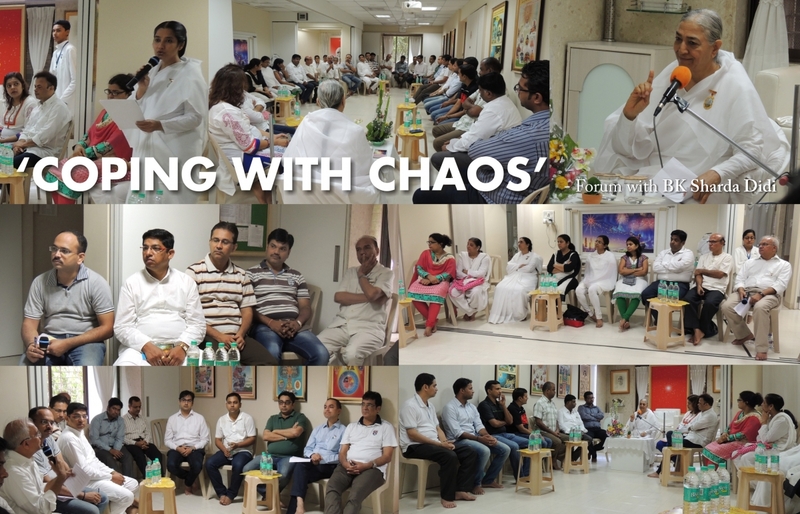 A Forum meeting titled “ COPING WITH CHAOS” was held on 26th June 2016 at Brahmakumari center at Ghodbunder Road, Thane (W). About 35 professionals and corporate executives from diverse fields attended this forum. BK Sharda didiji, senior faculty trainer from Ahmedabad led the forum. BK Sister Harsha, a Rajyoga Teacher and In-charge Brahmakumaris Ghodbunder centre welcomed the guests and introduced BK Sharda didiji to participants. Sharda didiji spoke on the subject. She said that under the same chaotic situation outside, three different people will react differently, depending upon their individual state of mind at that time. So it is not from outside to inside but inside to outside. We cannot change situation outside but we have total control over our reaction to any situation outside. To cope with chaos outside, we need to empower our inner self. We have to learn to be positive inside to face any negative situation outside. I have to know who I am? I am a soul with seven inbuilt positive qualities i.e. truth, peace, purity, love, happiness, soul power and bliss. When I am in a state of my being, I am in total control of myself and my reaction to any chaotic situation outside will not be negative. After such introductory talk by Didiji, the forum was open for discussions by the participants. There were very active and lively participation by the attendees and many shared their real life experiences. Didiji offered her views on such real life situations. All the participants thoroughly enjoyed this forum and immensely benefited by the deliberations at the forum. After breakfast and vote of thanks by BK brother Jadish Shah, the meeting concluded.